Quite possibly the two most dreaded words in the average city-dweller’s life. For most of us it’s a fact of life, something we have to face every day, whether we like it or not. Long or short, the simple act of getting from point A to point B at the same time as everyone else is mostly a tolerable, but almost never pleasant, experience. For mine, I usually stick to the same route going driving in to work in the mornings, but I have a couple of different routes that I use to get home. One uses surface streets extensively, while the other makes use of L.A.’s ubiquitous freeways for part of the trip. Time-wise, it’s probably a toss-up as to which one is better. Unless some outside factor is involved, such as an accident, taking either route ends up taking roughly the same number of minutes behind the wheel. My choice is usually a more matter of mood, I suppose. The freeway route involves less “thinking.” This isn’t to say that I don’t think while I drive; far be it from me to say I’m a “superior” driver like most people tend to, but I don’t text/e-mail/talk on the phone while I drive, and I do pay attention to what’s going on around me. I have been known to fiddle with the radio, though. At least I’m honest about my decidedly average driving skills. The surface street route is more scenic, but with cross traffic, bicyclists, pedestrians, and those annoying runners who’ve never discovered that magical modern invention, the “sidewalk,” there’s definitely a higher level of thinking involved. The freeway, at least, doesn’t have those distractions: it’s just all of us slogging slowly along in the same direction. Of course, moving at that slow rate of speed does give one a chance to look around. Every time I take the freeway route, I pass multiple interchanges, one of which I have discovered has an unexpected bonus attraction. Road-wise, it’s unremarkable: 10 lanes of freeway passing under a sweeping two-lane curving on-ramp that rises high overhead. To the east sits a cemetery and a Ford dealership. To the south, housing. The west side of the freeway is dominated by a large office complex and shopping center. Sandwiched between all that development, the freeway, the six-lane boulevards and attendant streets, sits a small, unremarkable chunk of land, adorned with a sign promising future development on the site. Above it all, perched high on a light post at the apex of the curve of the on-ramp above the freeway, he sits. A small red-tailed hawk, quietly surveying his domain. Right in the middle of the city, the most “city” part of the city, even, a creature of the wild has carved out his niche. He’s the survivor of the years and decades of attrition, of the L.A. basin swallowed up and paved over in the name of “progress,” surviving on a couple of acres of scrub land (and no doubt the nearby cemetery). He’s not alone, of course. When one stops, slows down, looks around, it’s surprising how often the natural world is at play, even if it’s been driven into the background of the din of city life. It’s full of drama, too. I still recall sitting at a stoplight years ago, at the 10/405 interchange, watching two small birds fighting off a raptor. As the hawk glided on a thermal, the other two took turns attacking, swooping above him, diving down and striking at him, to protect their nest and drive him away from their young. Not playful games, but a literal life-and-death struggle going on while the rest of us sat in traffic, worrying about office politics, celebrity stories and, yes, stupid certification exams. Whatever my stress about those exams might be, they most certainly aren’t a literal life-and-death issue. I think about the red tail I see on the top of that pole, gazing down on ten lanes of slowly moving traffic; I wonder what his future will be. Those couple of acres of land will be developed one day, no doubt when the economy picks up. They’re not the type of thing any environmentalist will go out of their way to save: bounded by development and surrounded by roads and freeway, it wouldn’t even make a good park. When it does happen, he will move on, I suppose. Move to some other open bit of land, fight another raptor for territory, food, mates. There’s no need to anthropomorphize it, to project human emotions on to him; that’s just the way life is. He’ll do what he needs to do to survive. It’s my hope that he will. When that day comes though, the day that I see the brush being torn up and the bulldozers start to flatten that small piece of land, I will be saddened. I will know that something will be lost, something small, but like so many other small somethings that have been lost it will be one more contribution to the concrete and asphalt wasteland we have created and continue to create. Even more, though, I will miss his presence. I will miss that small reminder that, even in the heart of the city, wild things can still find a way. I will miss that regal presence that he and all raptors naturally have, perched on high and scowling over his domain as I roll slowly by underneath. I will miss that reminder that, even as I get caught up in my own problems and dilemmas, there’s a larger world out there, with its own stories and dramas taking place. I will miss that seeing him serves to remind me of that, even if for only a few moments. Maybe I’m the only one who sees him, the only one who notices his presence high overhead. Or maybe others do, and think nothing of it. Just another bird. Easily dismissed. Easily forgotten. For me, though, seeing him and being reminded of the larger, wilder world that exists all around us is a good thing, even if it’s only briefly; it’s something that’s too easy to forget living in the modern metropolis of Los Angeles. When he is gone, the world will be just that much emptier for the loss. Kinda makes you wish an eccentric billionaire would buy the land and turn it into a habitat. Seeing an eagle always brightens a drive too. I think our freeway will have the green space as long as I am alive….if not I will definitely mourn it as I did all the trees they took down for ‘improvements’ just before the Olympics. And runners run on the road as the sidewalk go up and down a lot! And that gets tedious after a while……..
Awww… This is such a moving piece! I am really glad that you are back for regular posting. OMG Falky! I had a hawk when I was a girl, in our backyard (because we nursed him to heath when he was very young) and he looked just like that. I’ll never forget his regal manners, hawks are all kings and queens. Progress… and the stake of so much. We should have learned by now to do things differently but, ah, the power of the wealthy. You need to find a job outside the city GH. You need to move out of the concrete wasteland and return to the real world. Who knows, if developers are smart enough to build a tower with ledges, you might get a hawk’s nest—complete with the requisite hawk-cam—out of the bargain. Okay, so not much of a bargain, but still. . . .
JustAGirl – How many trees did they take down? Okay, fine, the sidewalk goes up and down, but do they have to run in the middle of the traffic lane? SkyBlueStateOfMind – Thanks! As for the non-cute creatures, I suppose humans are just naturally tuned to liking cute, furry things (or defining things as “cute” for that matter). Does this mean you welcome the cockroaches into your home and cuddle up with them at night? Narami – you had a pet hawk? That’s so cool! Why didn’t you ever become a falconer? Bruce H – Yeah, I know. Not many IT guys needed in the middle of the wilderness, I guess. Beautiful post, GH. Your writing is like poetry. I miss seeing the horses I used to pass on my morning commute. They always made me smile. 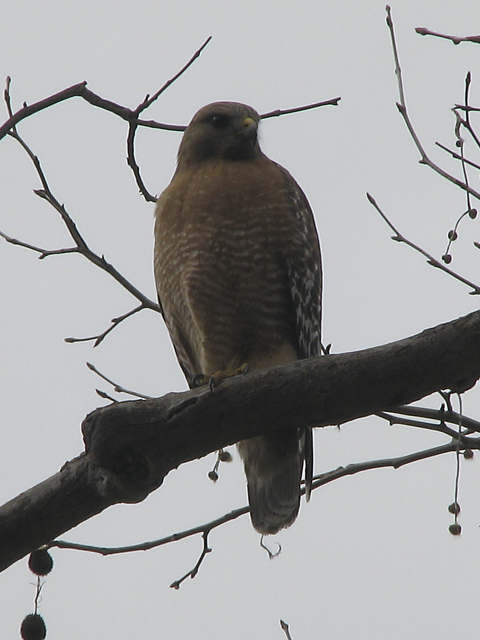 And though I enjoy a good hawk spotting, I also get freaked out that I’ll soon witness him/her taking out a smaller bird. My dad often shoos the hawks from his backyard in an effort to protect his beloved doves and hummingbirds. It’s really pretty remarkable how much wildlife still exists in the city. Seeing deer and skunks and raccoons in Hollywood makes me hopeful that all our wild friends will forever find home territory amongst our destruction of their habitat. Have you watched the documentary “Dirt”? I think you would enjoy it. loved reading this post. but i thought the same thing as seine – he took a photo while driving? and it didn’t come out blurry?